Numerous historical references, some of which date back as far as the end of the 18th century, show that compared to salami products in other areas of Italy, the development of the production of Salame Piemonte was absolutely different. In his 1854 work Cucina Borghese, Giovanni Vialardis, Royal chef for the House of Savoy, describes how to prepare “pork salami” using a recipe very similar to today’s, which even back then included the addition of “a glass of good Barbera wine”. The use of red wine with a designation of origin, produced with the three most famous Piedmont grape varieties (i.e. Barbera, Nebbiolo and Dolcetto), demonstrates this product’s strong ties with the territory. 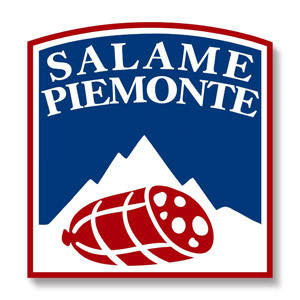 The production area of Salame Piemonte PGI is within the entire territory of the Piedmont region. The lean part of the paste is made with striated muscles from the thigh, shoulder and stomach, while the fatty part consists of high-quality fat from the stomach, neck or adipose tissue. The salami is seasoned with salt, pepper grains (pieces and powder are also admitted), spices and aromatic plants like garlic, cloves – whole, ground or infused with wine – and nutmeg, and red Piedmont wine with a designation of origin, made exclusively with Nebbiolo, Barbera and Dolcetto grape varieties. The product is then ground in a meat grinder and kneaded. 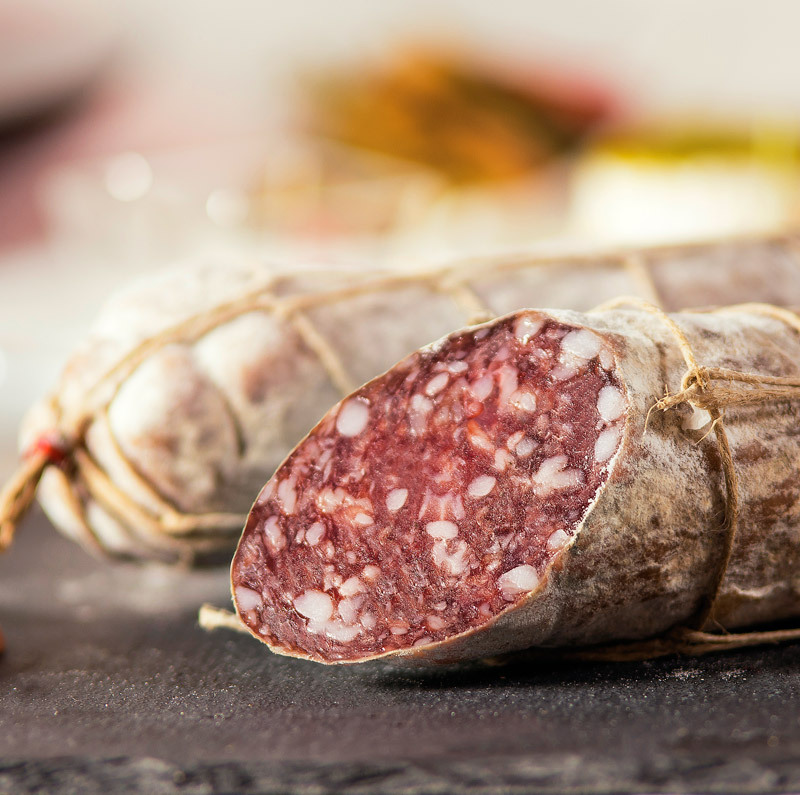 The Salame Piemonte PGI is stuffed into natural casings or natural reconstituted casings and tied with twine. Curing takes place in cool and ventilated rooms for varying periods of time, depending on the diameter of the fresh salami: from 10 to 50 days (40-70 mm), and from 21 to 84 days (71-90 mm). Salame Piemonte PGI is cylindrical in shape, or curved (smaller sizes), and weighs no less than 300 g. The slices are ruby red in colour and has a compact and homogeneous consistency, with visible pieces of cracked and/or finely ground pepper. The paste is characterised by its tenderness and sweet delicate flavour, mainly due to the short curing period, and for the unusual aromatic notes given to the use of red wine. It has a delicate smell, with a seasoned aroma of wine and garlic. 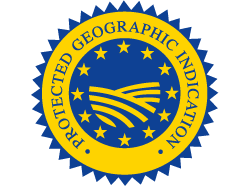 Salame Piemonte PGI is produced by a small number of producers but most of them use a very high quality raw ingredients: for example, there are some who use Barolo – a very expensive red wine of Piedmont – for the mixture.